Widely recognized as an outstanding fishing resource, this striper fishery deserves special mention as one of the nations finest with potential to produce record fish in the 50 lb category. Beaver Lake also hosts healthy populations of largemouth bass, spotted bass (Kentucky), smallmouth bass, white bass, channel catfish and white crappie. The black bass population of Beaver Lake, which includes largemouth bass, spotted bass and smallmouth bass, is strictly managed. High water levels during the spring spawn result in excellent reproduction of all three species. Catch-and-release is important for maintaining these fish populations. Generally, better fishing for the 3 black bass species and crappie is in the upper portion of the lake, upstream from the Highway 12 bridge. Exceptions include the heavily timbered coves, including Molder Hollow and Fords Creek. During fall, winter and spring, stripers, white bass and hybrids can be found anywhere in the lake. As surface water warms, a thermocline forms. White bass migrate to the thermocline, while stripers and hybrids will inhabit the cooler water below it. Largemouth bass are the most sought after black bass species in Beaver Lake. Most of the bass range from 1-2 lbs, but trophies over 7 pounds are taken annually. In Spring, Largemouth bass will hold in flooded brush along gravel areas in back bays. Spinnerbaits, suspending Rogues, jigs n' pigs, tube jigs and plastic worms are good lure choices. During the last half of spring, surface baits, like small buzzbaits, Zara Puppies and Tiny Torpedoes, can be deadly on calm mornings. In summer (July through September), largemouth bass can be found anywhere from the shallows to depths in excess of 40 feet. They form small schools and relate to flat areas off ledges, old roadways or stumps. Most feeding occurs during twilight hours or at night. Stickbaits, including Smithwick Rogues or Husky Jerks, work well on calm mornings, especially if bass are feeding on shad. In general, jigs n' pigs, tube jigs, plastic worms and lizards tend to catch more fish. Look for transition areas where gravel changes to chunk rock. In fall, bass will begin to migrate to winter holding areas and stage along fast-breaking channel bends. Most bass are taken on crankbaits and jigs in these areas. 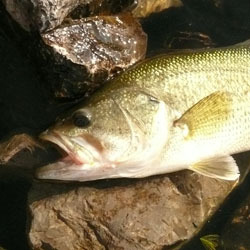 In winter (December through March), largemouth bass concentrate along channel banks with chunk rock. Casting deep-diving crankbaits tight to the rock and retrieving slowly in a stop-and-go manner can be deadly. In recent years, smallmouth bass have been stocked, with natural reproduction of smallmouth reported. Trophies up to 5 pounds are caught annually. Spotted bass are also quite abundant in Beaver Lake. Most average 12 to 13 inches, but some 15-inchers and larger are caught. In spring, Smallmouth and spotted bass are usually found in depths less than 15 feet near slowly tapering gravel areas. Most of the developing smallmouth population is located between the Highway 12 bridge and Hickory Creek. Unpainted jigs dressed with smoke or smoke/glitter Mister Twisters or other plastic grubs work well. As spring progresses, look for fish to move to chunk rock points with ledges located near the spawning sites. In summer, spotted and smallmouth bass can be found on main lake points composed of coarse gravel and chunk rock. Points that stair step into deep water tend to hold more fish. Deep-diving crankbaits catch fish under overcast skies, but day-in and day-out, jigs and grubs or jig/finesse worm combinations account for more bass. In fall and winter, both smallmouth bass and spotted bass may school together and hold in the same areas as largemouth bass. 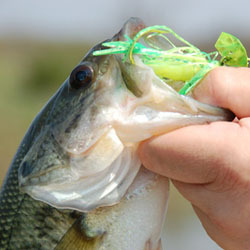 This time of year the fishing can be hot, with multiple bass species taken from the same area. Of the temperate bass species, white bass are native, abundant and average 11 to 12 inches. Larger white bass over 17 inches are not uncommon. Striped bass and hybrid striped bass offer a true trophy fishery. Most hybrids taken average 5 to 7 pounds, but 12-pounders are landed on occasion. Trophy striped bass grow to over 40 pounds, but 12-to 20-pound fish are most common. Beaver Lake currently holds the state record with a 57-pound striper. In spring, most stripers and hybrid striped bass can be found suspended 20 to 40 feet over open water near tapering gravel points. Schools of shad move to the surface to feed at dusk and disperse over shallow water. Feeding stripers move shallow after the forage. Fish can be occasionally taken during the day by casting large (1/2-to 3/4-ounce) horsehead jigs dressed with white bucktail, but bigger fish tend to be caught at night on Cordell Red Fins, Smithwick Rogues or No.18 Rapalas. Live bait anglers use gizzard shad or bluegill and a 3-to 5-inch balloon tied 6 to 12 feet up the line. White bass congregate in the upper ends of running creeks and are taken on white marabou jigs, Road Runners or Mepps and Rooster Tail spinners. In summer, stripers and hybrid stripers are usually taken with deep trolling methods. Downriggers set from 30 to 60 deep are commonly used. Lures of choice include, Red Fins, Rapalas and lightweight salmon spoons. In the fall, cooler surface temperatures allow stripers to feed shallow. When schools of shad disperse just under the surface at night, stripers feed heavily. Springtime tactics also work in fall. In winter, Stripers roam all over the lake but tend to collect in areas where gizzard shad are abundant. Some locations include the open water inside the mouths of large bays, main lake rock shores exposed to strong wind and upper ends of creeks and rivers with current. Night fishing with surface stickbaits, either cast or slowly trolled, is the preferred angling method. Choose baits that have a flashy color, like chrome/black or chrome/blue. White crappie are more common than black crappie, comprising 75 percent of the population. White crappie average 11 to 12 inches. Crappie caught over 14 inches are usually white crappie. Growth rates for both crappie species are excellent, with size restrictions imposed for maintaining the populations. In spring, crappie hold near either brush or gravel, but they tend to be easier to catch near brush. Cast small white or pink jigs in depths less than 10 feet. When crappie are very shallow, use a small bobber to suspend a tube jig (1/16-ounce) or minnow about 1 1/2-feet deep. In summer, fall and throughout winter, crappie will relate to structure in deeper water. Many large fish attractors are located in depths from 25 to 30 feet deep. Local anglers have also placed numerous private brush piles to attract crappie schools. These areas are easily fished with 1/16-ounce jigs dressed with plastic grubs, tubes or marabou. Crappie anglers can expect a bonus big bass or catfish holding in these areas as well. Bluegill are rarely targeted by anglers although available in numbers in drowned wood cover. Abundant channel catfish average 13 to 17 inches and provide an excellent summer fishery. Channel cats over 24 inches are considered big. Blue catfish, on the other hand, grow to larger sizes and may average 22 to 25 inches, but their numbers are not near as high as channel catfish. Flathead catfish averaging 15 to 20 inches are also present. Each detailed map provides depth, contours, structure, boat ramps, and updated fishing information. 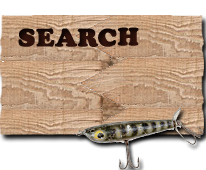 Beaver Lake fishing maps also include lake info such as gamefish abundance, forage base, water clarity, weedline depth, bottom composition, complete latitude/longitude grid lines and dozens of GPS waypoints & coordinates.